Canadian studio MacKay-Lyons Sweetapple Architects completed Cliff House, a boxy wooden cabin that’s a bit more exciting than your average weekend getaway. 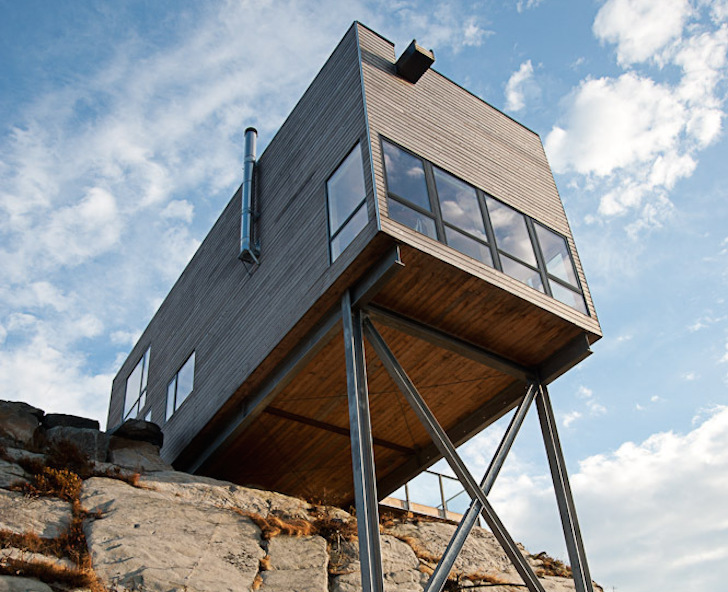 Precariously perched on the side of a rocky slope in Nova Scotia, the timber retreat was designed to stimulate the “experience of flying off [a] cliff.” The minimalist cabin optimizes passive solar gain and was built with a low-cost and limited materials palette. The 960-square-foot cabin was designed with a modest facade and minimal site disturbance so as to keep the focus on the surrounding untouched landscape. The low-budget project comprises three main elements: the galvanized superstructure that anchors the house to the bedrock, a light steel endoskeleton, and a simple wood framing system. The timber frame, cedar shiplap siding, and ventilated rain screen respond well to the region’s harsh freeze-thaw cycles. An open-plan, double-height living and kitchen space dominates the Cliff House interior and is partially projected off the cliff. Glazed windows wrap around three sides of the space to optimize natural light and views of the Atlantic coastline; a large south-facing deck expands the footprint of the room to the outdoors. A mezzanine bedroom and a bathroom are tucked behind the living room. The 960-square-foot cabin was designed with a modest facade and minimal site disturbance so as to keep the focus on the surrounding untouched landscape. The low-budget project comprises three main elements: the galvanized superstructure that anchors the house to the bedrock, a light steel endoskeleton, and a simple wood framing system. The timber frame, cedar shiplap siding, and ventilated rain screen respond well to the region’s harsh freeze-thaw cycles. An open-plan, double-height living and kitchen space dominates the Cliff House interior and is partially projected off the cliff. 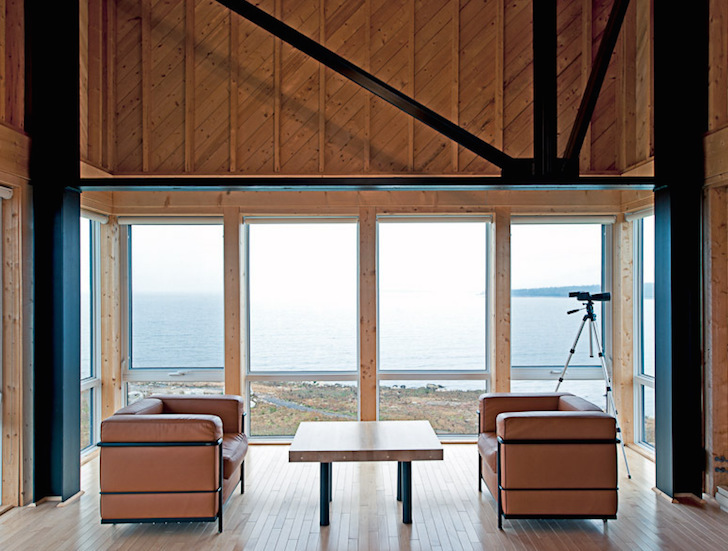 Glazed windows wrap around three sides of the space to optimize natural light and views of the Atlantic coastline. A large south-facing deck expands the footprint of the room to the outdoors. A mezzanine bedroom and a bathroom are tucked behind the living room. The minimalist cabin optimizes passive solar gain and was built with a low-cost and limited materials palette. Plan view of the Cliff House.